Kids grow so fast, it doesn’t take long before their rooms can feel pretty small… but before you plan an addition, here are some simple solutions that might help. “Kids grow so fast, it doesn’t take long before their rooms can feel pretty small… but before you plan an addition, here are some simple solutions that might help. 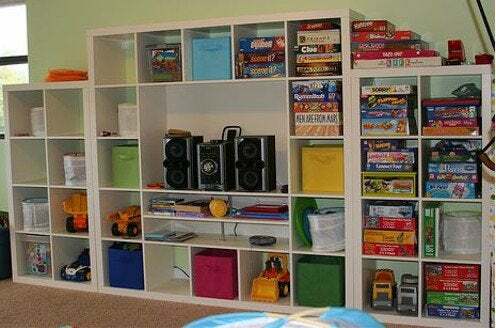 Start by giving toys their own space: an alcove, an enclosed porch or a wide hallway is a great place for built-in shelves or benches with toy storage underneath, keeping the bedroom just for sleeping. If two kids over age 5 share a room, bunk beds work wonders and can be lots of fun. For long, narrow bedrooms, take your cue from nautical berths or swedish box beds with a short dividing wall between the beds and curtains for privacy. Cover busy shelf areas and tv and computer screens with cabinet doors, a drop-down desk or a simple curtain. Install slide-out baskets for organizing toys and art supplies in clear bins with labels. Just like in the workshop, bins and labels eliminate a lot of excuses when it comes time to clean up!